The quiet coastal town and fishing harbour of Bermagui is one of the prettiest and most peaceful sights on the Sapphire Coast. The area was first settled by Europeans in the 1830's. This area is the home of the Yuin aboriginal community and there is much here of cultural and historical interest. 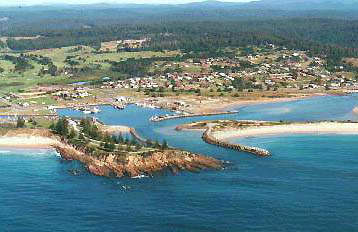 Bermagui was made internationally famous by the American author Zane Grey who pioneered the sport of gamefishing here in the 1930's. Many thousands of people come to Bermagui each year to enjoy fishing - the most popular sport in Australia. The edge of the continental shelf is closest to the mainland off Bermagui Deep sea fishing, Bermagui and this geography provides wonderful fishing grounds for amateur, deep sea and game fishing. The boat harbour has a safe all weather entrance and a large launching ramp.There are facilities around Bermagui for fishers of all types including boat ramps, trailer parking and a gantry for weighing in the one that didn't get away. Our beaches and lakes also offer fabulous fishing. Children too can fish, in the safe waters of the lakes, pools and beaches of the area. Around Bermagui are forested areas, nature reserves and National Parks that include a wide variety of our native flora and fauna. You will find many beautiful bush walks and picnic spots in these areas. Don't forget your camera! Behind Bermagui lies Gulaga (Mount Dromadery) which was sighted by Captain Cook on his Australian discovery voyage. Between Gulaga and Bermagui, Wallaga Lake offer visitors a wealth of activities including many water sports and bush walks. The Wallaga Lake Cultural Centre is a display of Koori cultural history and contemporary activities and will give a fascinating insight into their history and appreciation of this wonderful area. To the north you can see Montague Island and a day trip there will introduce you to little penguins and seals. Montague lighthouse is fascinating for visitors of all ages. Surfing is also popular in the region and there are plenty of beautiful beaches around for all levels of swimming, body and board surfing. Bermagui township itself offers everything the tourist should need including good shopping, recreational and entertainment facilities. Licensed clubs wlecome visitors and our restaurants can cook up a fantastic meal for you from our fresh daily catch. A range of accommodation is available in and around Bermagui including motels, caravan parks, camping areas and homes and units for lease. Entertainment options are also varied in the Bermagui / Bega region.